In Poe Field all is confusion. Bate’s Brigade is raked by heavy small arms and artillery fire. The 58th Alabama doesn’t even leave the forest. Clayton’s Brigade intermingles with Brown’s retreating regiments, and does little more than cover the retreat. However, just to the south the Union line is crumbling. 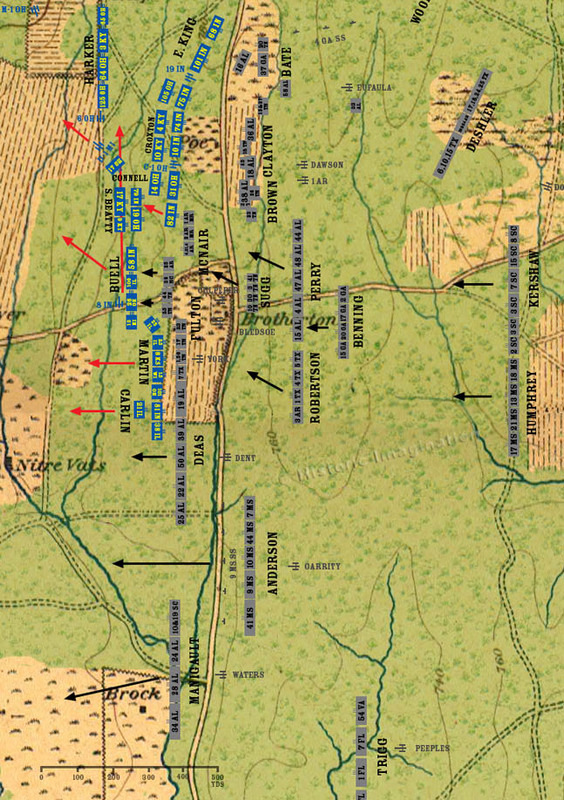 McNair’s Brigade is stopped by the 82nd Indiana at the barricades, but after reforming they push the Union regiment back. Fulton’s Brigade slams into the flank of Buell’s brigade as they begin to march north in column. Most of Buell’s men flee. The 8th Indiana Battery flees north over the prone men of General Samuel Beatty, killing and wounding several. The Federals of Davis’ division put up a sharp, but short fight. They fire a few volleys, but Martin’s brigade does not quite fully deploy before the Confederates close the range. The 35th Illinois collapses from the pressure, and the rest of the division routs as each regiment is flanked in turn. Soon the entire division is fleeing from the field.